When you're decorating, the only thing better than new furniture might be free new or new-to-you furniture. Delve into a few ways to obtain chairs, tables, desks, beds and more for your home or office without spending any money or diving into a dumpster; quality trash, however, can be a valid resource, in some cases. If you have to update your find, explore basic cheap or free ways to give it a fresh look. Perfect wing chair discarded from luxury home. Find freebies in local classified ads. 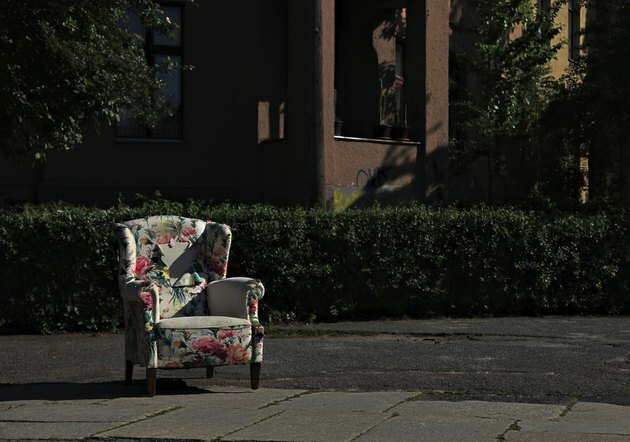 Often, people prefer to have someone take away their old or unwanted furniture for free, so that they don't have to haul it to the dump or thrift shop, or pay for removal. So, if you spot a sturdy office desk or a floral sofa that, after a thorough steam cleaning, might fit your shabby-chic or eclectic living room. Don't hesitate or you might miss out. Often, garbage can be design gold, but check your city's trash bylaws before dumpster diving or curbside-garbage shopping. Typically, when someone puts out their trash for collection, it's fair game for whomever wants to collect it. In some areas, free-trash days are an annual event. Not only does this practice mean a surplus of free household goods for you, but reduced waste in landfills. Search online for government grants or inquire at local churches or charity organizations about no-cost ways to obtain furniture. You may be able to select from new or pre-loved pieces, or be entitled to funds to help you buy furniture, such as beds, a table or lift chair. Be prepared to explain why you need a grant, from illness or advanced age, to low income or financial hardship. Freecycle advertisements are similar to classified ads, but they are dedicated to giveaways, as the name implies. Shop for gratis furniture on your favorite website, your neighborhood listserv, or post a "Wanted" ad for something specific, such as a wingback chair, ebony side table or Mid-Century Modern armoire. Or, look for car parts, old doors, outdated cabinets or someone's leftover tiles or lumber to craft your own pieces. For example, an old wine barrel can be rejigged with open shelves or cupboard doors as a conversation-starting bar or entryway cabinet. A soapy sponge bath may be all that a set of retro, molded-plastic or assorted vinyl dining-room chairs require to unearth their decades-old beauty. A smear of petroleum jelly left overnight on a wood table's white rings can eliminate any such unsightly water stains. Sometimes, fabulous finds are tucked away in your own attic, garage, shed or even the living room, awaiting your creative touch or a little TLC -- tung oil, lacquer or cleaning. Who Do I Call to Pick Up Used Furniture for Donation or Disposal? Where Can I Dump Garbage?